The restoration of eelgrass (Zostera marina L.) is a high priority for Puget Sound ecosystem recovery. In 2011, the State of Washington set a restoration target to increase eelgrass abundance by 20% in Puget Sound by 2020. Locating areas to restore eelgrass effectively and efficiently has been challenging for researchers. A 2018 article in the journal Restoration Ecology reports on efforts to identify potential restoration sites using simulation modeling, a geodatabase for spatial screening, and test planting. Protecting nature and maintaining the ecosystem functions of intact, diverse and resilient habitats is far easier than trying to restore systems that have experienced years of degradation. For centuries humans have shaped the landscape surrounding the Salish Sea with unintentional effects on natural resources. Recently, the Puget Sound Partnership has been tasked with the recovery of the resources and ecosystem services that make Puget Sound so appealing and ecologically significant. Eelgrass, Zostera marina, is the most abundant of the six marine seagrass species that grow along large portions of the Puget Sound shoreline between +0.5 m to -13 m (MLLW). Seagrass plays a key role in the nearshore ecosystem and provides food, shelter and nursery habitat for a wide range of organisms. Eelgrass also helps minimize erosion by stabilizing shoreline sediments and sequesters nutrients and carbon dioxide. However, eelgrass is also sensitive to many stressors such as direct physical disturbance and degradation of water quality, particularly diminished light levels that reach the plant. The ability for eelgrass to quickly respond to changes in its environment makes it a valuable indicator of ecosystem health and an important resource to track. In 2011, the Puget Sound Partnership set a challenging eelgrass recovery goal of 20% more eelgrass by 2020. To help achieve this goal, a team of scientists from Pacific Northwest National Laboratory, Washington State Department of Natural Resources, and the U.S. Environmental Protection Agency developed a model that predicted eelgrass performance throughout the Sound under varying environmental conditions. The process generated an eelgrass restoration model and geodatabase that prioritized sites suitable for eelgrass transplantation. The team transplanted eelgrass at test sites to verify model output and the potential for achieving the 20% target. Eelgrass restoration is an iterative process starting with test-transplants, monitoring, and if successful, a large-scale transplant effort followed by continued monitoring. Since 2013, over 80 eelgrass test-transplant sites and 15 large-scale sites have been planted in Puget Sound with mixed success. The scientists acknowledge it’s difficult to track abiotic and biotic stressors that impede transplant success and often times return to a site to find eelgrass transplants drastically reduced or entirely gone. 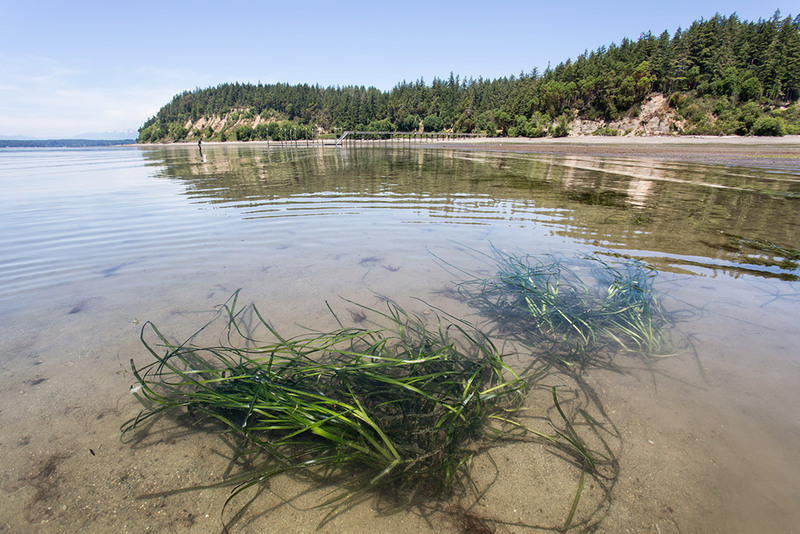 Eelgrass restoration still faces many challenges in Puget Sound. The eelgrass restoration site suitability model developed the process for identifying sites in an area as large and complex as Puget Sound. Yet, fine-scale data are needed to improve model predictive capabilities and overall eelgrass transplant success. Continued research will investigate donor populations, transplant methods, and site-specific factors such as sediment chemistry and light. Other challenges that may hinder progress on eelgrass restoration in Puget Sound include urban development from population growth, the recent introduction of the European Green Crab (Carcinus maenas), and global climate change. Thom, R., Gaeckle, J., Buenau, K., Borde, A., Vavrinec, J., Aston, L., ... & Kaldy, J. (2018). Eelgrass (Zostera marina L.) restoration in Puget Sound: development of a site suitability assessment process. Restoration Ecology.